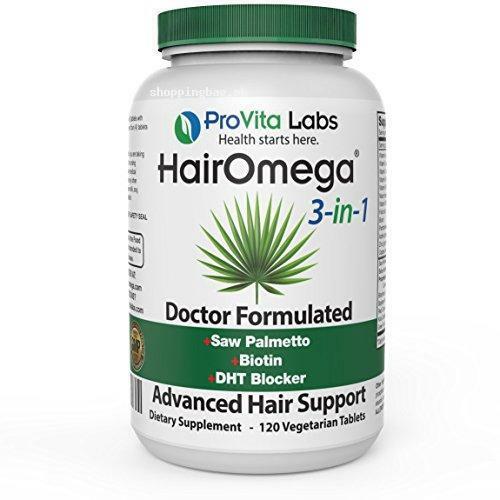 Search and find out from our exclusive collection of online shopping in Pakistan Hairomega 3-in-1 DHT Blocker Supplement for Hair Loss by ProVita Labs from the category of Hair Loss products that is of imported quality products and are available to you at low price in Pakistan. It is suitable for both men and women and is 3-in-1 formula that is best for hair loss or hair thinning. Hairomega is having extracts in place of powders by comparing ingredient list to other supplements. It is made in USA. Hairomega helps you in features Saw-palmetto and beta-sitosterol to block hair loss causing DHT. This Hairomega 3-in-1 DHT Blocker Supplement for Hair Loss is also having hair nutrients such as biotin that will nourish hair follicles and improve hair growth. It is also contains Ginkgo biloba and grape seed extract that will enhance healthy circulation to the root of the hair. You can explore more from our online shopping store in Pakistan such as; Lipogaine Big 3 Premium Hair Loss Prevention shampoo for Men and Women (2 in 1 formula), Dr. Formulas Hairomega Vitamin Gummies Hair Nourishing System for Hair Loss and Thinning – No, Revivogen Shampoo and Conditioner Value Pack and many more. Place your order instantly and enjoy online shopping in Pakistan at low price in Pakistan with cash on delivery across Pakistan. Hairomega uses high-quality standardized extracts instead of powders, compare our ingredient list to other supplements and see for yourself! Made in the USA. Results guaranteed or your money back! 2. It contains essential hair nutrients like biotin to nourish hair follicles and hair growth. 3. Ginkgo biloba and grape seed extract may promotes healthy circulation to the root of the hair.